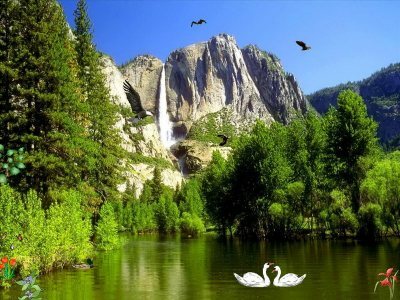 Welcome to the eagles kingdom high in the mountains with magnificent waterfalls and lakes. Here is their territory and they are the main inhabitants of this place. Download and install free nature screensaver on your computer and take an unforgettable journey into the kingdom. Grand waterfalls, mountain lakes, green rage, waterfowl, deer and of course the eagles vigilantly guarding their territory against uninvited guests. Enjoy four scenes changing each other on the background sounds of nature. Besides you will find different settings and analog clock. End User License Agreement (EULA). This document is a legal Agreement between you, the licensee and FullScreensavers.Com & Lion`s Production. Please read this Agreement carefully before installing the program. Downloading, installing and using this software you do not get any rights to intellectual property contained in the product, except for those rights which are given to you by this License Agreement.